Reserve un pase de un día para el popular Sunscape Splash Resort con anticipación para garantizar su admisión. Con el transporte incluido desde el puerto de cruceros de Montego Bay, puede pasar el día explorando los toboganes y piscinas, hacer una pausa para un almuerzo incluido y disfrutar de las bebidas del bar abierto. Excursión en tierra para familias. Bar abierto por el día. Transporte de ida y vuelta desde el puerto de cruceros de Montego Bay. This is an excellent excursion for the money. The Resort is beautiful and the food wonderful. There is a fabulous meal set out with many food choices inside the dining room for resort and day pass guests from around 11-2 as well as burgers and other comfort food offered continuously in a separate little dining area. The bar is open and the staff very friendly! Snorkeling is moderate but the beauty of the Jamaican beach makes up for that. 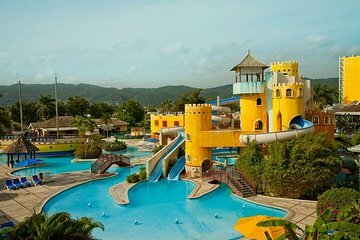 There are many amenities for one to enjoy like water slides and pools. Viator makes it easy to relax and enjoy. Cons: Bus was a bit crowded but the staff was very accommodating and it was part of the adventure. This is the second time we have used Viator. Highly recommended.